This week EASST partners met in Chania, Crete for our annual All-EASST partners meeting, and celebration of our 10th anniversary, which took place within the framework of the biannual meeting of the Global Alliance of NGOs for Road Safety and the biennial meeting of the UN Road Safety Collaboration. EASST partners Make Roads Safe Hellas who are based in Crete have taken a lead role in coordinating the meeting which has included participants from over 150 road safety NGOs from all over the world. The week started with capacity building workshops for our partners, giving them the opportunity to get together, share experiences, discuss strategy, and learn from each other, and their road safety projects. As part of the Global Alliance meeting EASST was involved in a number of sessions, including the day-long symposium on post-crash response and participating in workshops ranging from effective enforcement, safe defensive driving skills, work with legislators and gender and road safety. In partnership with Humanity and Inclusion (HI), we co-facilitated a workshop on Safe and Inclusive Mobility for All, presenting the results of our regional work on disability, mobility and road risk and calling for decision makers to ensure the participation of all groups, including persons with disabilities, their representative organisations, in the design, implementation and monitoring of local and national policies and projects on road safety and urban mobility. On Thursday 11th April we were the hosts of a special symposium road safety and responsible travel and tourism. Here we launched our report on International Tourism and Road Safety in Greece, the culmination of a year-long research collaboration with Make Roads Safe Hellas, the National Technical University of Athens, the University of Macedonia, the University of the Aegean and the Hellenic Open University to examine the relationship between tourism and road safety, with specific attention on tourists’ perceptions of road safety in Greece. In the evening, hosted a special reception and dinner to mark our 10th anniversary. 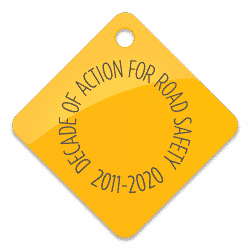 This will include the launch of our ‘10 years of saving lives’ impact report and video looking back at our work on road safety capacity building and development since 2009. The report covers many of EASST’s biggest achievements from improvements in enforcement, education and engineering, to post-crash response and inclusive mobility. While also discussing the geographic, political, social and economic challenges faced in the region, and how we seek to address them as we keep momentum to reduce road deaths by 50 per cent by 2030. As the week rounded off, EASST Director Emma MacLennan spoke at the High-level Symposium hosted by the Alliance and Towards Zero Foundation, on the Decade of Action from an NGO perspective and toward 2030. Where we were also surprised and delighted to receive the 2019 FedEx Road Safety Award for exceptional commitment to road safety and growing impact. We would like to express our deep thanks to FedEx, the Global Alliance of NGOs for Road Safety and those who nominated us for this huge honour. The conference has been a major preparatory event for next year’s Third Global Ministerial Conference on Road Safety to be held in Sweden. EASST has enjoyed being part of an exciting and active week – contributing actively to the agenda, sharing our experiences, learning from others and bringing a regional voice to the global road safety debate.